I wake expectant, hoping to see a new thing. One of the pleasures of retirement is having the time to do things, to see things, and to take advantage of the situation when the unexpected occurs. The other day I was working on a project in the yard and was using a mattock to dig in the clay-based swale running next to the house. I was creating a small depression for a stone that will serve as a pad for one end of a foot bridge across the drainage area. A mattock is a very efficient tool for cutting through the earth, but since I only needed a shallow depression, I was making small cuts with it. After slicing away a sliver of clay, I saw something in the depression and laid down the mattock. The object was dark and somewhat bulbous. I stooped for a closer look. I suddenly realized it had legs protruding from the sides of what must be a large abdomen. It was a spider! I ran and got a hand trowel to attempt to expose the rest of the spider, not knowing whether I had accidentally gashed it while wielding the mattock. I have seen spiders like this a couple of times in the past, so I thought it might be one of the Trapdoor Spiders (most likely Ummidia sp.). The spider appeared undamaged, although certainly not pleased at its current situation. I touched it and it moved slightly…alive, but probably not happy, and maybe in some sort of state of torpor. This spider is large, a little over an inch in length, indicating is is a female (males average half that length). 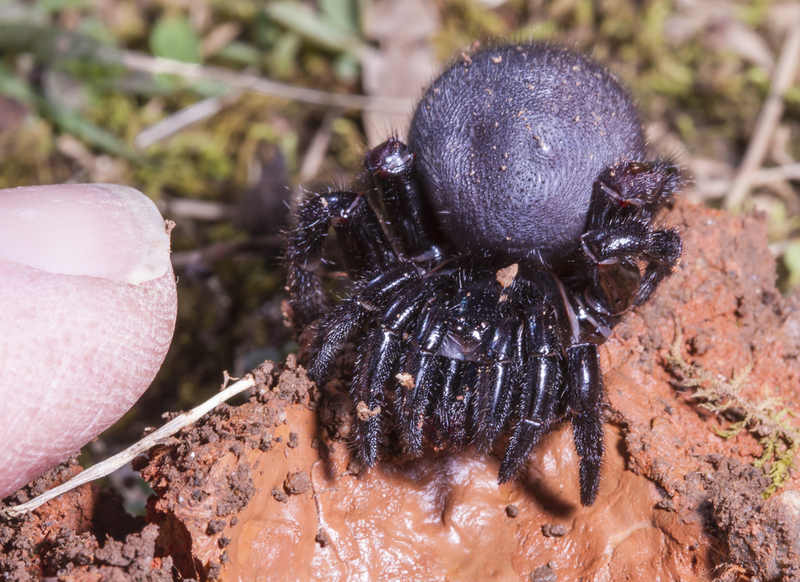 Though one of our largest spiders, Trapdoor Spiders are rarely seen, since they spend most of their time in burrows. The few specimens of this spider I have seen in the past were probably males wandering about in late summer looking for mates. 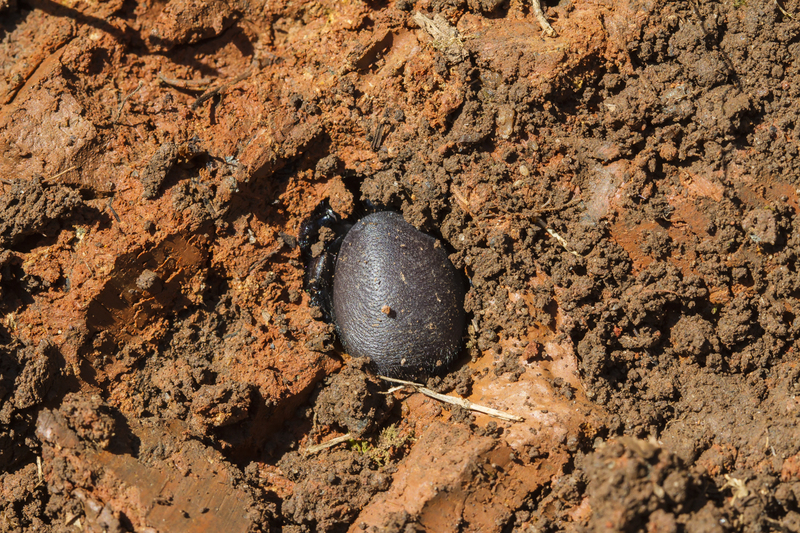 This genus digs fairly shallow burrows that are silk-lined and covered by a well-camouflaged hinged lid, or trapdoor, up to one inch in diameter. 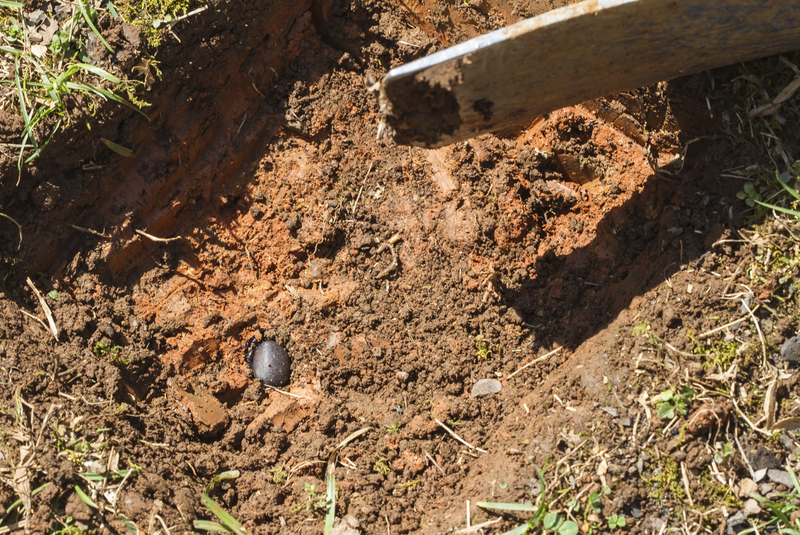 The spider was nestled in a smooth cavity in the clay about three inches below the surface. A close look at the photos showed a fine silk lining to the cavity. I had not noticed a lid as I was digging, but my spider field guide let me off the hook by saying… the superbly camouflaged trapdoor can be easily overlooked even by the trained eye. 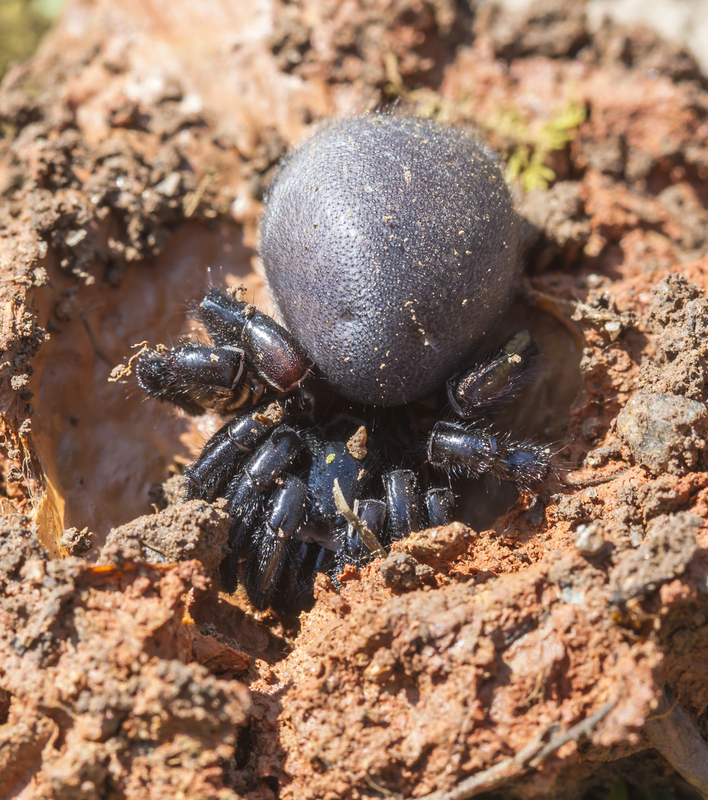 Trapdoor Spiders capture prey by hiding in their burrow and pouncing on passers-by (luckily mainly insects and other spiders). After a few photos of the sluggish subject, I decided to rebury her in a large flower pot in the garden, hoping she will survive fluctuating temperatures and rainfall. I could not find much on the life history of these interesting creatures online, so I will be checking on her when it warms up, but hoping she moves elsewhere and digs a new burrow. This species is in the mygalomorph group of spiders, which also contains the tarantulas, and most are believed to be long-lived (up to several years). I hope she lives a long and happy life, and that I encounter her or her kind again soon. These moments of discovery are one of the things I treasure about living in the woods and having the time to pay attention, to see new things. But no matter where you live, be sure to make some time for uncovering the beauties of the natural world around you. 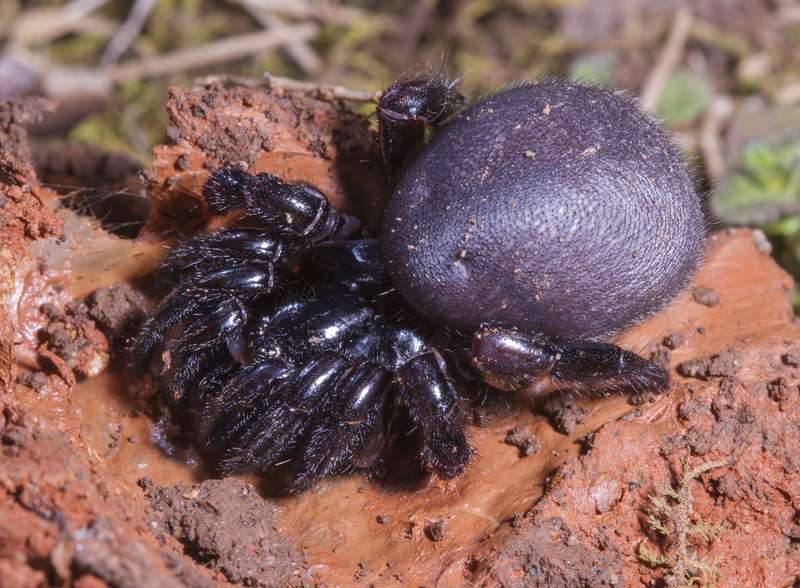 This entry was posted in Natural History and tagged trapdoor spider by roadsendnaturalist. Bookmark the permalink. And I am so glad I didn’t mash it with the mattock…certainly its lucky day.